One of the first things that Professor Jonathan A.J. Wilson PhD, who is a partner at Dragonfly Black, let’s you know in his Halal Branding book is that Halal is not a brand. So let’s just start there to get this right from the get go. He describes it as ‘a descriptor and therefore can be termed an Ingredient Brand’ just like Fair Trade, Sugar Free and Organic for example. So with these examples we could consider Halal to be termed ‘suitable for Muslims’. There is yet to be a global Halal food brand as such, but Muslim cultures who eat Halal have introduced the food of their country in many restaurants, that may or may not include being Halal, which are enjoyed by all, such as Turkish, Moroccan, Lebanese, the list goes on, with the crowning one being Indian. The Indian curry has conquered the whole world, and it may not always be Halal, but a large proportion of the people who eat it will also be looking for Halal. So including ‘Halal’ on the menu will increase their patronage, making it worthwhile. However, this is just a small sector of what has been turned into a new multi faceted Muslim consumer market that Professor Wilson is introducing to you in his book. 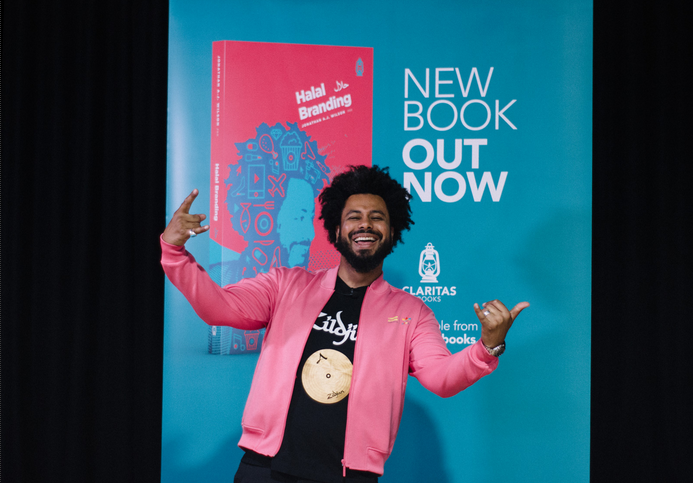 “What I drive home in my book, ‘Halal Branding’ is that Halal has moved beyond Meat and Money, and successful marketing necessitates strong branding. For Halal Branding to work, it has to be understood as an alternative branding approach, in theory and practice. The next generation of Muslims have arrived into the consumer market, and they are “dynamic, nuanced, culturally influenced and unpredicatable.” They consider themselves part of the western culture they have been raised in and want to fit in with the fashion, ethical goals, and the lifestyle of their friends and co-workers. They are looking for higher end products, and luxury brands, that don’t normally cater to the Muslim market. When deciding on the cover design he said that he wanted to make the book cover aqua and hot pink because he wanted to signal that it’s time to shake things up with fresh thinking and to celebrate a more feminine side, that he feels needs championing. But this is just the beginning introduction to his extraordinary book which covers all aspects of the culture of branding in a way that you have never heard it said before. A must for those who are part of, or wanting to reach out to, a quarter of the world’s population today.